What does it mean to be an artist? Anabella Lenzu’s latest show, La noche que dejaste de actuar/The night that you stopped acting, which began as a reexamination of her repertory, is now a one woman show which both questions and affirms the reality of being a creator, an artist, and a spectator. I had the pleasure of conversing with Anabella Lenzu about the challenges and triumphs of creating artistic content within a very unique framework. Inspired by exchanges with her close friends around the world and at home, La noche que dejaste de actuar/The night that you stopped acting is where exploration meets experiment, and has implications for the field of dance at large. AMW: What is La noche que dejaste de actuar/The night that you stopped acting about, and how did it come to be? AL: Initially, I identified five key pieces of my repertory to revisit: The Grass is Always Greener (2010), The Corral (2009), In Pursuit of Happiness (2015), Pachamama: Mother World (2013), and Sangre y Arena (Blood and Sand) (2012). As we moved forward, we began to investigating the very nature of the creative process, asking: “If a work of dance is created in the here and now, what happens when the here and now changes? 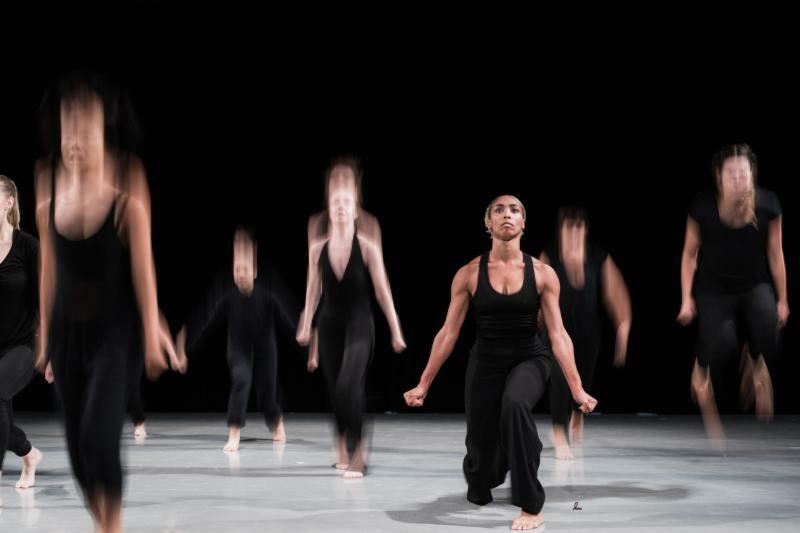 How do the changes of our circumstances, our lives, and our bodies, alter our approach as dancers and choreographers?” These are the questions from which the show was born. I have drawn inspiration from my repertory by referencing texts, props and projections used in my former works, but La noche que dejaste de actuar/The night that you stopped acting is otherwise completely new. It swings from political to ritual, touching the wide range of topics I have explored in the past. I hope to answer the questions above, as well as inform the works’ originality. AMW: I understand that you have collaborated with several artists for this new work. Can you explain your process so far? AL: In October 2018, I reached out to friends of mine from around the world. They are dancers who have known me very well, each one at different times in my life. I had multiple Skype conversations with an Italian artist Salvatore Cataldo, who is currently living in Cairo, Egypt, Satomi Suzuki from Japan who danced for me many years ago, and Soledad Gutierrez in Buenos Aires, Argentina, who was my very first assistant. None of them had ever seen the pieces that I wanted to revisit. Once the show evolved to become about the creative process rather than the repertory itself, I began setting the new material here in New York City with the help of Maria Victoria Ric Biraben, an actress, and dancers Daniele Di Felice, an ALDD apprentice, Martina Cariello, Guiliana Bertoya and Angela Caputo, in November 2018. I will be the only one performing in the finished piece for the stage, but working through Skype and in the studio with them really helped shape the show and demanded more exploration of the creative process. AMW: What is it like to generate material for your show over Skype? AL: We were frustrated that we could not communicate certain things over Skype. For example, when improvising, we could only see about 50% of what the other is doing. We sometimes could not see all of the details, or each other’s faces, and I definitely could not feel their body in space. I couldn’t feel their vibrations and they couldn’t feel mine. Luckily, these are people that I trust and who know me very well. We’ve collaborated before, so we already know what that person’s energy is like in person, but sometimes we felt this empty gap between what we saw on screen and what our imaginations lead us to believe was there. Often we would have interruptions, large time differences, connectivity problems…The topic of the show is the creative process, and unexpectedly, these difficulties we were having with technology actually enriched it. We began to ask certain questions because that’s where the technology would take us. 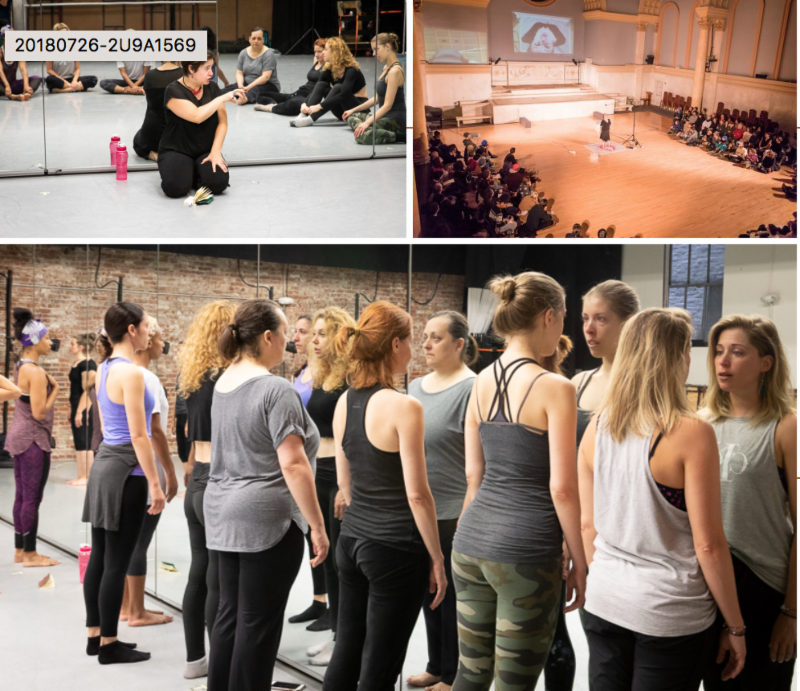 AMW: How has the work that you have been doing with your friends abroad and your dancers in New York translated to your piece as a one-woman show? AL: All of the work that I did with them pushed me to explore the anatomy of a performance. When I perform this show I will be examining the relationship between myself as the artist and the audience, as well as the relationship between myself and the self I am presenting on stage. For example, there is a scene where I ask myself while on stage “Can I take my mask off? How far can I go? How far can I get?” In another scene, I question the audience. I ask them, “What do you think is true? What do you think is false?” I ask them about the things we may have in common, whether or not they have trust in me, and if there is a line that I as the performer cannot cross. AMW: You are going to hold an open rehearsal for La noche que dejaste de actuar/The night that you stopped acting in June. What are the details surrounding this event? AL: There will be an open rehearsal for donors and friends on Friday June 28th at Lehman College in the Bronx as part of the CUNY dance initiative from 12:30 – 1:30 pm. AMW: Finally, how would you define your own creative process? AL: I’ve been choreographing since I was 16, and now I’m 44. Each piece takes me more or less 2 years to create. What I try to do is have each creative process be a different one, or else I get bored. What ignites the idea for a show can always change, it can be a painting, a piece of music, or in this case it was my long distance friendships. The creative process for me is the reason why I do what I do, so I don’t want to have a formula. What’s important for me is to be open and to create, and really live in the moment. This show is about the craft itself, about the mask falling, which is why it’s called La noche que dejaste de actuar/The night that you stopped acting. I don’t worry about forcing results or having a product in mind when I create…I completely trust that the result is going to be there because the process is so rich. “No more beautiful dances” wrestles with the ideas of exploration, introspection and reframing a woman after becoming a mother, and being an inmigrant. Lenzu’s dance film uses spoken word and drawings to tell a personal vision of femininity, and what it means to be a woman today. Students develop alignment technique and an understanding of the dynamic in dance. Increase flexibility and strength as well as to develop muscular awareness in order to prevent injuries. Using phrases of ALDD repertory, students solve technical problems. Proper technique is the foundation for learning to dance and control the body, showing how to use one’s muscles, achieve balance, and become aware of posture and placement. Students experience and study Anabella Lenzu/DanceDrama (ALDD) repertory. The emphasis is on the journey rather than the destination, on understanding the impulses generated by movements and gestures. The search is for authentic and honest movement. Derived from our most basic impulses, these dance works use this principle to examine relationships between the individual and society, exploring communication, identity, memory, and spirituality, the relationship between people and their environment, the struggle for women’s identity and their role in society, and the nobility of the body as a temple for our mind, soul, and heart. It is an honor for me to be able to sustain and support dancers in the delicate task of cultivating their awareness of themselves as individual artists. As we become aware of our passions and strengths, we are able to wake the creative impulse in others. I seek what is essential and want to connect or reconnect people with the joy of dance. Please join us for “My body, my country”, an intimate performance and workshop with visual artist and choreographer Anabella Lenzu. How does our body become our homeland? What does it mean to be a female human? How do our bodies become a receptacle and messenger of the multiple realities we are immersed in? During the 2 hour event, Anabella Lenzu performs excerpts of her dance-theater piece of “No more beautiful dances”, followed by a 10 minute Q & A. The performance challenges the viewer to think about how they view bodies. The performance will be followed by a Body Mapping Workshop, where the participants use texts and drawings to share their own story of their bodies. Body Mapping is an inter-generational dialogue tool helping people of different generations to talk to each other. The experience builds trust and deepens people’s understanding of how their lives are all connected with each other. The aim of this event is to explore issues of identity and agency, as experienced by a contemporary artist who is also a woman, mother and immigrant in the United States. Through the shared creative process, we will explore identity and social relationships. This performance and workshop is open to audiences of all genders and ages interested in exploring the female perspective through movement and visual expression, and to experience a journey of self-discovering the body and accepting yourself anew. No previous experience is required. Comfortable clothes that allow movement are recommended. Originally from Argentina, Anabella Lenzu is a dancer, choreographer and teacher with over 25 years experience working in Argentina, Chile, Italy and the USA. As Artistic Director of Anabella Lenzu/DanceDrama, Lenzu draws on her diverse background to create thought-provoking and socially-conscious dance-theatre in the interest of improving our human condition. She holds a MFA in Fine Arts (concentration in Choreography) from Wilson College, PA. Classically trained at the renowned Teatro Colòn in Buenos Aires, Lenzu studied the modern dance techniques of Humphrey/Limòn and Graham in New York. Her studies of Tango and the folkdances of Argentina, Spain, and Italy, further inform her work. Her choreography has been commissioned all over the world, for opera, TV programs, theatre productions, and by many dance companies, such as Anna Sokolow Theatre/Dance Ensemble (New York) and Movimento Danza (Naples, Italy). Lenzu founded her own dance school L’Atelier Centro Creativo de Danza in 1994 in Argentina, and has maintained an active teaching career ever since. Currently, Lenzu conducts classes at Peridance Capezio Center and is Artist-in-Residence at NYU Gallatin Lenzu has written for various dance and arts magazines, and published her first book in 2013, entitled Unveiling Motion and Emotion. 25 años de L’Atelier Centro Creativo de Danza! 25 años pasaron desde la creación de LAtelier Centro Creativo de Danza! Gracias a todos los que pasaron por nuestro nido, gracias por su apoyo y por creer que la Danza no es solo un entretenimiento, es un trabajo diario para mejorar la condición humana! Honrada de crear un espacio donde la gente pueda aprender danza como expresión de Arte en mi comunidad de#BahiaBlanca. CLASS DESCRIPTION: Find your inner-strength; develop & improve alignment and technique; explore and learn how to efficiently use your body and your energy in a healthy way as instruments of your expression. Through this class, you can increase flexibility and strength, overcome physical difficulties and incorrect posture, and acquire physical awareness to help prevent injuries. Open to all levels of experience. CLASS DESCRIPTION: Expand your craft, technique and creativity in an exclusive, personalized, classes. This is an opportunity for dancers, actors and performers to develop their potential on both movement and theater performance skills and connect both to become more authentic, expressive performers. This class explores the principle: Motion Creates Emotion /Emotion Creates Motion, and emphasizes the use of imagination, interpretation and body coordination and control.